An educator since the early 1960s, Jerry Uelsmann began assembling his photographs from multiple negatives decades before digital tools like Photoshop were available. Using as many as seven enlargers to expose a single print, his darkroom skills allowed him to create evocative images that combined the realism of photography and the fluidity of our dreams. 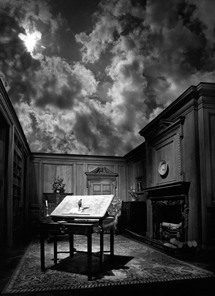 Check out these amazing Jerry Uelsmann books for more magic! You may also want to check out this video on the creative process of Jerry Uelsmann and his wife, also a fantastic artist, Maggie Taylor.